The first time I met Randa Markos, she was fighting on a regional card in Ontario, Canada for a promotion called Provincial Fighting Championships. At the time she was 2-0, both wins by submission. She was quietly becoming one of Ontario’s most intriguing female prospects. It didn’t take long to figure out she styled herself a grinder. She took her opponent down in the first minute and punished her for the length of the fight. The patience of a veteran was shown as she took a unanimous decision. The post-fight interview put forward a young woman that was still unsure whether she belonged in the sport. She was quiet, shy and humble. Fast-forward ten months and that quiet, shy and humble woman is on the verge of becoming a household name in the world of combat sports. 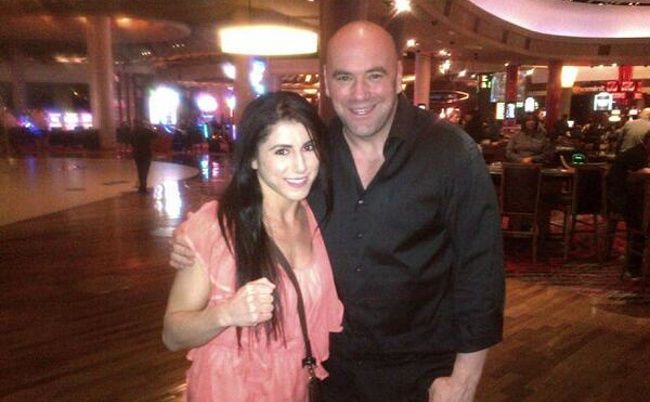 She is a contestant on The Ultimate Fighter 20, which debuts on September 10. She spent six weeks this summer in Las Vegas filming for the most anticipated edition of the show in some years. This season’s winner will be crowned the UFC’s first ever 115lb. women’s champion. For this young pharmacy assistant from Windsor, Ontario, it’s been quite a rollercoaster. “It was the toughest thing I've ever had to do,” said Markos. That’s a bold statement, considering what this Iraqi immigrant has had to overcome. At the age of three, Markos and her family moved to Windsor. The Gulf War forced the Markos family from Iraq, where they were held at gunpoint and imprisoned for trying to escape. Her immediate family ended up in Canada. The rest were split, and remain in different parts of the world to this day. Some moved to Italy, others to Australia and some are in California. Markos and her family ended up in Windsor because her mother had an aunt in the area and she took care of their VISAs. Her dad became an alcoholic, and would verbally and physically abuse the family. She would come home and try to avoid confrontation at all cost. Like so many kids who face a challenging home life, she looked for affection elsewhere. She didn’t need much of a reason to stay away from the home, and when she heard her high school offered wrestling, she was hooked. An announcement over the loudspeaker at school caught her attention and it instantly clicked. Her cousins in California wrestled, and when they visited they would beat her up. This was her chance to learn a few skills so she could hold her own. She was good at it. It gave her a sense of belonging she had never felt. An immigrant to Canada, she often couldn’t relate with the other children, especially when her parents would let her participate in the activities so many others were privileged to. Wrestling provided her with friendship, confidence and a purpose. As it has done for so many others, wrestling led to other combat sports. The first time she saw MMA live, it was her now husband competing in the cage. The technical aspect appealed to her, and already having years of wrestling under her belt made for a smooth transition. She began training at the Maximum Training Center in Windsor, complimenting her wrestling with a smothering submission game and strikes that kept opponents off balance. Armed with her skills and a resiliency instilled in her early on in life, Markos compiled a 4-1 record as a professional on her way to The Ultimate Fighter. Representing Iraq and Canada, Markos enters The Ultimate Fighter house with a chip on her shoulder. She knows she is an underdog and will be looking to prove something. Her suffocating style lends itself to a tournament format, as she can get top position and hurt opponents without accumulating damage. It makes her a live underdog in a tournament that, more often than not, doesn’t go as planned. When she made it to The Ultimate Fighter house, it was part one of a dream. The other parts include a UFC contract (also in check) and a long reign as 115lb. champion (yet to be determined). MMA offers Markos the validation her father never could. She’s shy, but she appreciates all the support she has received. Maybe she’s a little overwhelmed from the media attention, but don’t be mistaken. She knows that the interviews and stories and cameras are all a part of becoming the great fighter she wants to be. The cage offers her a safe haven from what she left behind in Iraq and the troubled home situation of her youth. No one is forcing her to fight and no one is telling her she cannot do it. She does this for herself. With a fulltime job, a husband and loving family, Markos doesn’t need combat sports. What makes her dangerous is that she does this because she wants to. This isn’t for money or fame; she wants to be special. The shy, quiet and humble woman I met last October no longer exists. In her place is a strong, confident fighter who believes more than ever that she can be a champion. Having competed against the best 115lb. fighters on the planet, she now knows she belongs.